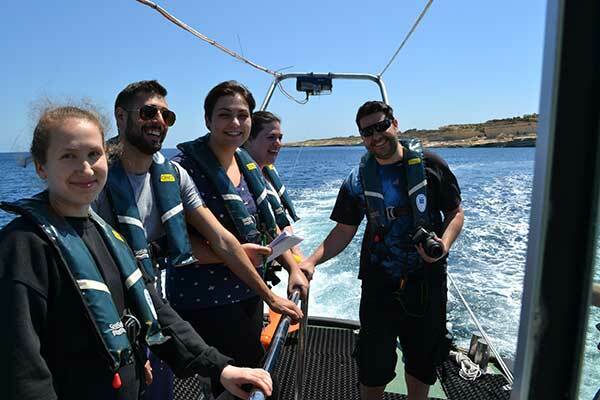 Earlier last week, the Physical Oceanography Research Group within the Department of Geosciences at the Faculty of Science organised the 'Applied Oceanography Boot Camp' as part of the Masters of Science (MSc) in Applied Oceanography. The research during this field work focused on the study of the thermal discharge (of cooling water used in connection with the Delimara power station operations) plume within the Ħofra ż-Żgħira embayment in the south-east of Malta, and the adjacent Ħofra l-Kbira as a control site. This study-unit saw the students spending a week together close to the area being surveyed to carry out hands-on experience in conducting scientific data collection efforts in the marine environment, and to learn the scope of field studies through active participation in group projects and individual research efforts. Students were introduced to the baseline principles involved in oceanographic field studies, data collection planning and execution, instrument calibration and deployment, data extraction and processing. Underwater temperature loggers (which continuously measure water temperature) and a sea current meter were deployed at various locations within the Ħofra ż-Żgħira embayment, limits of Delimara, along a permanent mooring deployed around half a nautical mile off the coast at a depth of 40m in May 2015, thus yielding over one year of data for such hydrodynamic parameters as well as for salinity. 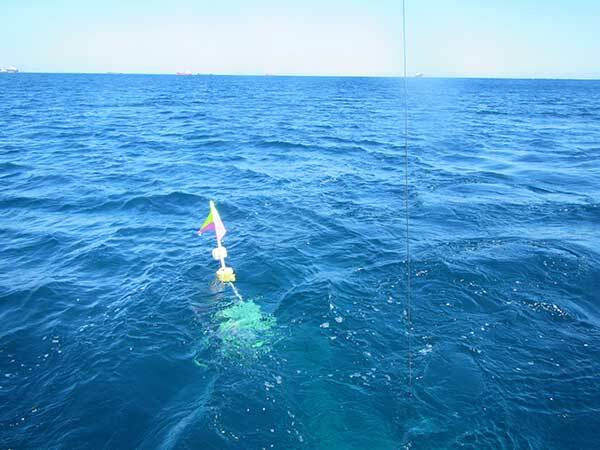 The deployed instrumentation allowed for an investigation of the variability of the sea temperature close to the seabed at high temporal and spatial resolutions. 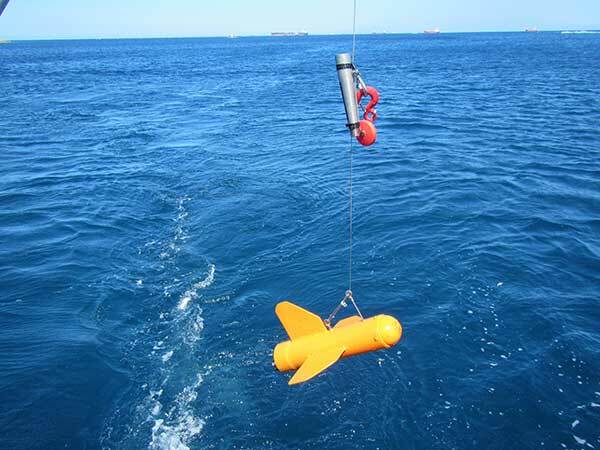 During the boot camp week, several instruments were deployed to provide additional surveys during different boat trips, including the use of: YSI CTD (to measure the water conductivity and temperature along the water column); five satellite tracking coastal drifters (to understand the coastal water circulation); chlorophyll fluorimeter (for chlorophyll profile measurements); Niskin bottle (for water sampling at several depths); underwater camera incorporated within a towed torpedo built in-house (for benthic mapping); Secchi disk (to measure the water turbidity) and onboard meteo-station. 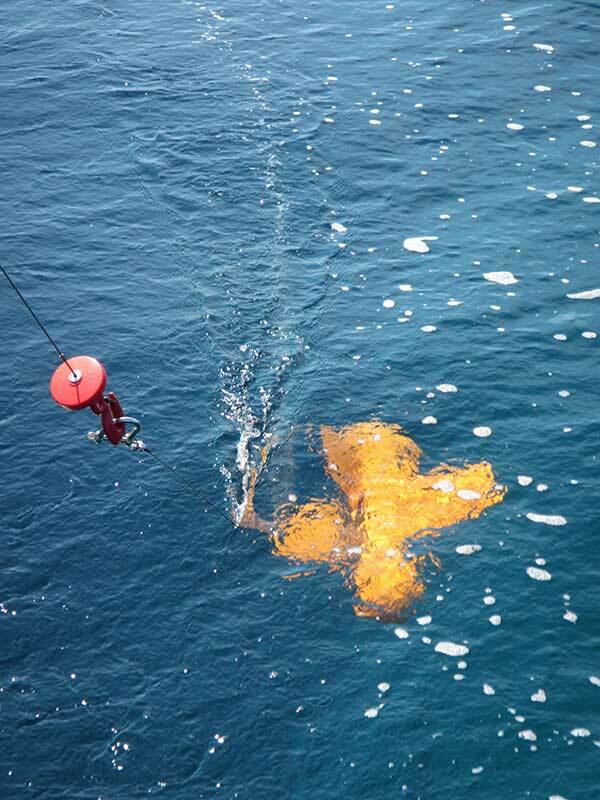 Benthic sediment samples were collected during SCUBA diving surveys by means of hand-held corers, with the same samples being collected at different distances from the thermal outfall being subsequently assessed for its grain-size parameters. These instruments and the measured data were the main focus of analysis during an intense live-in experience (boot camp) for the students reading the Masters in Applied Oceanography. This enabled the students to understand the dynamics of the warm water plume emanating from the power station within the context of the circulation patterns in this marine domain and to assess environmental impacts on the biota and marine habitats. The current hydrological and biological status of Ħofra ż-Żgħira vs Ħofra l-Kbira were compared. Such physical parameters are essential for the validation of numerical coastal models which have been implemented by the PO-Unit and which are currently being tested. The course also involved the engagement of students on basic chemical and biological oceanography techniques through the set-up of water-filtration and analyses facilities close to the field survey site. In this regard, the training and support provided by the Chemistry Department during the boot camp to its Masters students on such aspects is appreciated. Under the coordination of Prof. Aldo Drago, the Physical Oceanography Research Group has three other academic members (Prof. Alan Deidun, Mr Adam Gauci and Dr Anthony Galea) as well as dedicated technical and administrative staff members (Ms Raisa Tarasova, Ms. Audrey Zammit and Ms Tiziana Bartolo). The one-year Master course (over 3 semesters as a full-time day course) is offered annually to local and foreign students, and is delivered with the participation of an international faculty including high profile experts in operational oceanography. Apart from this Boot Camp, the course covers the Scientific and Practical Baseline of Oceanography, Essentials of Operational Oceanography, Data Resources in Operational Oceanography, Ocean Governance, and Applications and Services deriving from Operational Oceanography. The main target of the course is to match the human resource needs in the evolving marine sector at local, European and global scales, providing professionals with wide ranging skills to exploit the outcomes of marine research and technology in favour of the competitiveness of the industry and service sectors.